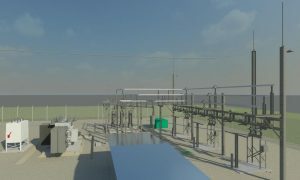 West Plains Engineering provided the services for the design and construction of the Rush Creek substation owned by NRPPD. The design included the writing of all electrical specifications for the purchase of major equipment, ground-grid design, conduit layout and design, substation steel drawings and purchase. WPE also designed the electrical protection schemes for the feeder reclosers and transformer differential and overcurrent protection, as well as relay panel layout and control wiring terminations. Our engineering staff, using a 3D graphics software program, was able to identify and solve numerous clearance and spatial arrangement issues long before they became a physical problem. This 3D design advantage potentially saved numerous change orders and wasted man-hours during the construction phase of the project. With a distribution voltage of 24.9kV, this substation will provide a substantial energy resource for a large geographical area in western Nebraska dominated by irrigation loads. It will also serve as a vital backup resource to other substations in the area.